The M-850 Hexapod is the first commercially available micropositioning system providing six degrees of freedom with 1 µm resolution that allows the user to define the pivot-point anywhere inside or outside the system's envelope. Rotation about that pivot point can be specified (with microradian resolution) for any axis of rotation. The M-850 Hexapod offers value for any complex, high accuracy positioning task where independent motion in six degrees of freedom is required. 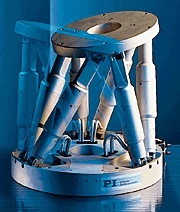 The M-850 Hexapod consists of six struts which expand and contract between a bottom and a top platform. Although similar to positioning systems used in flight-simulators, it is the first commercially available system to introduce this technique to sub-micron resolution positioning systems. The use of extremely stiff and accurate components for all moving parts such as joints, bearings and drive screws results in an unusually high natural frequency (500 Hz @ 10 kg load). The Hexapod principle requires all six struts to alter their length if a change of the platform in only one axis is desired. On the other hand, if only one strut alters its length, all six coordinates (X, Y, Z, QX,QY,QZ ) will be affected. This is the challenge in the Hexapod construction. The twelve multi-degree-of-freedom joints must guarantee guiding precision and zero backlash. Therefore, CAD (Computer Aided Design), FEA (Finite Element Analysis) modeling and laser vibrometry were employed for system optimization. In contrast to conventional multi-axis positioning systems, where a change in one coordinate also affects the pivot point and the other coordinates, theM-850 system automatically compensates for all unwanted motion. Sophisticated software automatically performs the necessary coordinate transformations and transmits the individual velocity/coordinate information to each motor controller axis. The M-850 Hexapod is delivered with an intelligent industrial PC based DC Motor Controller with RS-232 interface and user friendly software. The software allows direct six-axis positioning by entering the X,Y,Z and θX,θY,θZ coordinates as well as the pivot point. The software also allows easy programming of motion sequences. * The travel ranges of the individual coordinates (X, Y, Z, θX, θY, θZ) are interdependent. The data in this table show maximum travel (where at least one strut is totally extended). If motion in more than one axis is desired, the individual travel ranges given in this table are reduced. This is a legacy product that may have limited availability or may have been replaced. Ask a PI engineer for an equivalent new model.